Having explored a broad spectrum of styles and media throughout his career of 35 years, Norman Kirk at present devotes his principal work to watercolor landscapes. Kirk skillfully weaves large areas of white paper through his work, enhancing the passage of negative space with delicate pencil work. 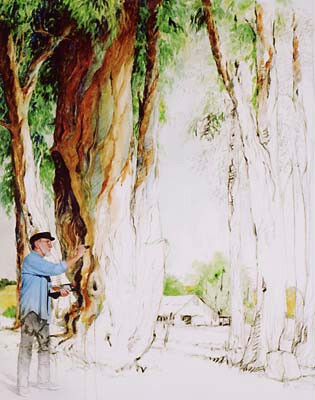 Since 1982, Kirk has taught watercolor painting at Ventura College. Schooled in the classics at the Cleveland Museum of Art, Kirk continued his studies at the Los Angeles Art Center School of Design, U.C.L.A., and Chouinards. Kirk is an esteemed member of the National Watercolor Society, Watercolor West, and the Gold Coast Watercolor Society. Works by Norman Kirk have been exhibited extensively in museums and galleries such as the Ventura County Museum of History and Art, Los Angeles County Museum of Art, California Museum of Science and Industry, Los Angeles Municipal Gallery, and the Buenaventura Gallery. Kirk’s work is included in the collections of the National Park Service, United States Department of Defense, Ventura County Museum of History and Art, and the City of Ojai. Norman Kirk’s documentation took place in 1998. The FOTM Archive contains extensive information about this artist.